The World Bank’s 2016 Doing Business report is out, and once again Grenada’s ranking has dipped. On this occasion the drop is 5 points from the previous year, moving Grenada down from position 130 to 135. This comes on the heels of a 7 point drop between 2013 and 2014, and a 23 point drop between 2014 and 2015. Worthy of note is the fact that of the 10 areas reviewed, Grenada registered improvement in only one single area, that is “Getting Electricity”, showing a movement up by just one point from #59 to 58. Grenada declined in every other area, with the most remarkable area of decline being “Dealing with Construction Permits”, dropping 5 points from 90 to 95. The review showed that Grenada occupies the unenviable position of being the lowest ranked OECS country. The Doing Business Ranking is a measure of how efficient a country is in facilitating investment and business operations, especially the operations of small and medium sized enterprises. It covers the entire business cycle from Start up to Wind up. It is a review of the legal and regulatory framework supporting the business cycle and is conducted by the Private Sector arm of the World Bank, the International Finance Corporation. The review currently spans 189 countries. The IFC Doing Business report has become an indispensable tool for investors who are seeking to get an insight into a country’s competitiveness and in many instances deciding whether or not a country is investor friendly. Given the importance of the review it is regrettable that Grenada has fallen into a pattern of persistent slide. This was not always the case, as during the period of the last NDC administration Grenada gained global recognition for its reform of the legal and regulatory framework for business. In fact, Grenada earned the distinction in the year 2010 of being one of the top ten performers among the more than 180 countries reviewed by the IFC, jumping an impressive 19 places from position 92 to 73. The NDC administration was able to achieve this because of the serious approach it took to Doing Business reform in particular and improved competitiveness in general. An Office of Private Sector Development was set up to drive the process. A task force was created, consisting of the heads of public sector institutions and departments who had hands-on responsibilities for delivering services to the private sector and the general public. Private sector bodies, as well as other civil society groups were part of this task force. The task force met monthly, worked closely, identified priorities and set deadlines. There was ownership and inclusion. The International Finance Corporation provided Technical and Advisory services. As a result many land mark reforms were undertaken, such as the creation of the Corporate Affairs and Intellectual Property Office easing business start ups, and the introduction of the advanced version of the electronic entry processing system at Customs, known as ASYCUDA improving Customs administration. For the first time in Grenada’s history an Investment Generation Strategy was designed. A blueprint was developed for the reform of the Grenada Industrial Development Corporation. At best the NNP has only given lip service to Doing Business Reform. They abandoned the task force approach, a template used by the most successful reformers like Singapore and New Zealand, and instead assigned a Cabinet Minister the task of working with one technician to manage what is in fact a complex agenda. There was no budgetary allocation. The minister was clueless. Nothing was accomplished. Not surprisingly, Grenada’s ranking fell. In 2015 the downward plunge continued. In the face of the embarrassment which the NNP was facing globally over its bad performance a desperate decision was taken to appoint a kind of Lone Ranger technocrat to accomplish the impossible from his office in the Ministry Of Finance. The evidence of the failure of this initiative is to be found in the newly released IFC rankings. The unsatisfactory business facilitating environment is made worse by the imposition of the 28 new taxes and levies in the last two years, which have weakened public buying power, a development that is bad for business. Add the Petrol Tax Amendment Act to that. At the same time the NNP administration has increased the bureaucratic procedures associated with the Payment of Taxes, taking out an extra toll in time and money from tax payers. All this must be a source of grave disappointment to members of the business community, who voted for an NNP that promised a more business friendly environment. 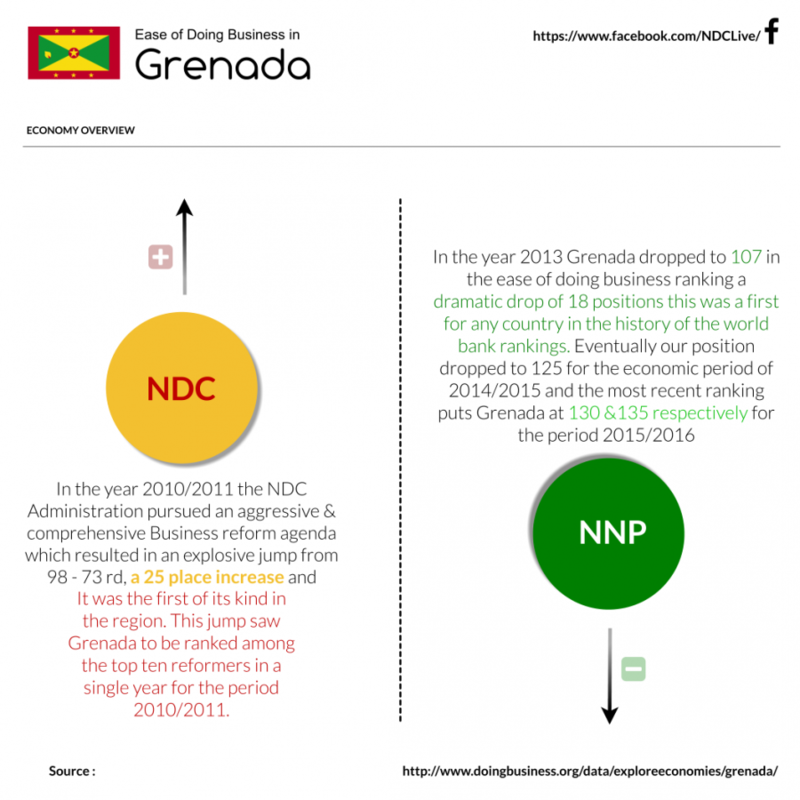 Grenada will continue its slippery slide downwards in the Doing Business rankings unless the NNP changes its approach. The approach has to be comprehensive and placed within a general drive towards competitiveness. Adequate human and financial resources must be put into it. There must be involvement and buy-in from the key players. Users of government services must be brought on board to design and review the process of implementing Doing Business reforms. Rhetoric will not cut it. The global competition among countries seeking to become more attractive to investors will only intensify. Grenada must either get serious or get left behind. The NNP government needs to abandon its flawed approach to Doing Business reform. 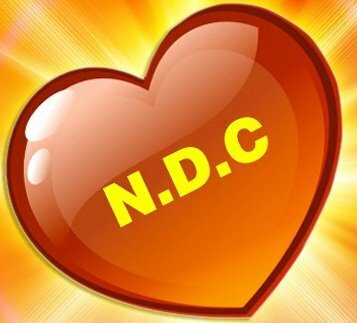 The National Democratic Congress stands ready to offerassistance or direction in this regard, especially as we regard Doing Business reformto be of national importance and in the nation’s best interest.